Indianapolis, Ind. 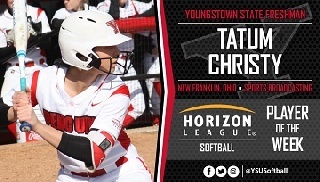 -- Youngstown State University freshman Tatum Christy has been the Horizon League Softball Player of the Week, the league announced on Monday. This is the first weekly award of Christy's career, and the second straight week a YSU player has won a league award. Last week, freshman Maddi Lusk won the league's pitcher of the week award. Last week, Christy led the Penguins to a 3-2 week and batted .727 in five games last week going 8-for-11 with a triple, home run and seven RBIs. She also posted a slugging percentage of 1.182. It marked Christy's first career home run and triple. The New Franklin, Ohio, native and went 4-for-4 with a triple and a home run and four RBIs in a 6-1 win over Valparaiso on April 1. She also went 3-for-4 with two RBIs in 6-5 loss to the Crusaders on April 2. Youngstown State returns to action with a doubleheader against Niagara, Wednesday, April 5, at 3 p.m.